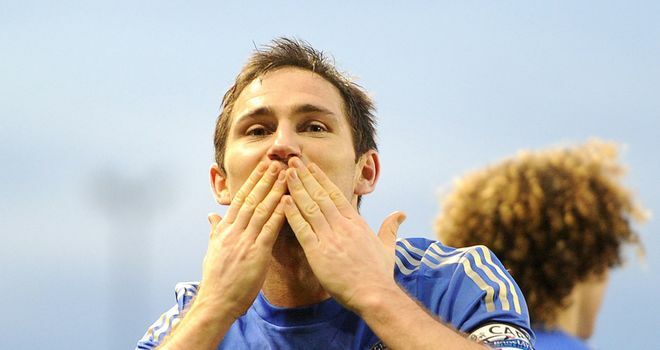 Chelsea look to have made a U-turn on Frank Lampard with talks understood to have begun on extending his contract. The 34-year-old's deal at Stamford Bridge expires in the summer and there have been few signs the club's hierarchy were willing to keep hold of the midfielder. When asked about the situation, Chelsea's head of communications Steve Atkins told Sky Sports News: "CFC do not comment on speculation about players or their contracts." But on Thursday afternoon, a day after Lampard scored England's winner in the 2-1 win over Brazil at Wembley, it appears there have been positive talks about a new deal between the player and the club's representatives. The former West Ham player has surprised everybody in recent weeks with a series of impressive performances coming on the back of a worrying calf injury at the end of last year. He came off the bench to curl in a fabulous winner for England on Wednesday on his 94th appearance for his country and despite his limited first-team action under interim boss Rafa Benitez, he has scored eight goals in his last 13 Chelsea appearances. While the latest news will be welcome news to most Chelsea fans, his performances on the pitch continue to impress his boss. Benitez told Chelsea TV: "He's scoring goals for us already and I think he's doing well. Ninety-four caps is a fantastic achievement. If he can get 100 it will be really positive and it will mean he will be fit, he will be playing and he will be doing well." Discussing the added motivation of reaching 100 caps and wanting to resolve his club future after the England match, Lampard told Sports journalists: "If I don't get to 100 caps, I have given everything in every game I have played. "Wherever I go, whatever happens in my career - and I don't honestly know - if I can play at a great level of football and play at my best I will just see what happens. "When you get older, you realize even more what it is to play for your country; that it won't go on for ever. "Every time I am in and around the squad, I will give my all, whether it is starting or on the bench. I have got a lot of respect for the manager and I think he respects that I want to help in any way that I can." Lampard's ambition to become Chelsea's all time leading scorer could influence his decision on signing a one-year contract. The midfielder, who has scored 15 times in 33 appearances for club and country this season, is six goals from breaking Bobby Tambling's record of 202 goals during the 1960s. Whether he stays at Stamford Bridge or not, Lampard is aiming to give himself the best opportunity to be part of the England squad for next year's World Cup in Brazil. "Maybe the World Cup is within reach but I'm certainly not getting carried away," he said. "I know how football is and from squad to squad it can change, and when you get to the age of 34, 35 this summer, people do look upon things differently and fair enough. "I'm very understanding of where I'm at in my career. "But if I can continue playing for Chelsea and continue contributing here, whether it's starting or as a valuable squad member, and when I do my bit, then the World Cup is getting a bit nearer. "It's certainly a target for me and, yes, I will try to keep playing at a good enough level to get there. It's a target. "I won't retire from England before that, put it that way."